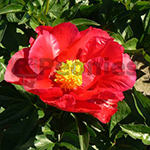 This Peony has the largest flower buds and the largest double red flowers imaginable. The flowers of adult grown plants come up to 20 cm in diameter. Commande Performance comes from the same cross as Lorelei. 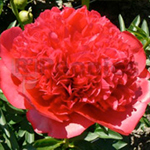 With this Peony has Hollingsworth found the greatest future in the leading varieties in the Dutch cut flower business. The big flower buds need some staking.